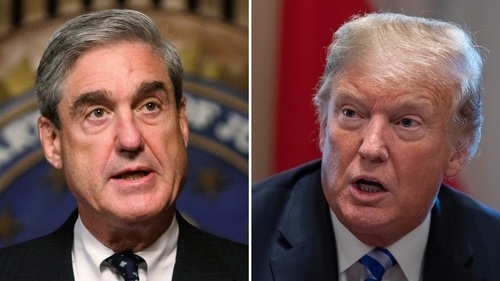 US Special Counsel Robert Mueller's report on Russian interference in the 2016 election did not find that President Donald Trump committed a crime but also does not exonerate him, according to a summary of Mr Mueller's findings released this evening. Mr Mueller, who spent nearly two years investigating allegations that Russia meddled in the 2016 election to help Mr Trump defeat his Democratic opponent Hillary Clinton, also found no evidence that any member of Mr Trump's election campaign conspired with Russia during the election. "While this report does not conclude that the president committed a crime, it also does not exonerate him," Attorney General William Barr quoted Mr Mueller as writing in his report on the issue of possible obstruction of justice. Mr Mueller said he would leave it to the attorney general to decide whether a crime was committed. However in a statement tonight, the White House Press Secretary Sarah Sanders said the findings of the Department of Justice were a total and complete exoneration of the President of the United States. Mr Barr's summary said Mr Mueller found no evidence that the Trump campaign coordinated with Russia, despite multiple offers from individuals associated with Russia. The release of the summary is likely to ignite a new political fight in Washington as Democrats push for Mr Barr to release the full report, and Mr Trump seizes on the findings as vindication of his near daily assertion that he was a victim of a "witch hunt" that has cast a long shadow over his presidency. The Special Counsel did not find any collusion and did not find any obstruction. AG Barr and DAG Rosenstein further determined there was no obstruction. The findings of the Department of Justice are a total and complete exoneration of the President of the United States." Mr Trump has always denied collaborating with Moscow or obstructing justice. Russia says it did not interfere in the election, although US intelligence agencies concluded that it did. Mr Trump slammed the probe as "an illegal take-down that failed", and said he had been completely cleared by the results. "It's a shame our country had to go through this. To be honest, it's a shame that your president has had to go through this," he told reporters in Florida before boarding his plane to return to the White House. A lawyer for Mr Trump said a summary of Mr Mueller's report on Russian interference in the 2016 election was more positive than he had anticipated. "It's better than I expected," Rudy Giuliani said, adding that he would have a statement on the matter soon.